After leaving Yourambulla Caves, we were even happier about our trip than when we started. 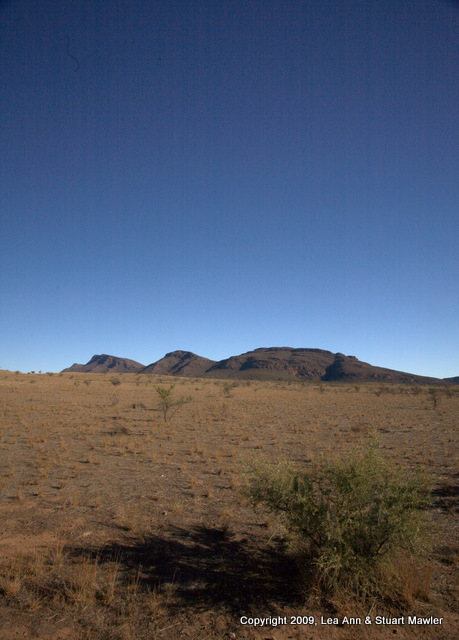 Believe it or not, many (if not most) of the Australians to whom we had spoken urged us not to bother with the Outback. (Oddly, this even included Australians who were also on holiday in the Outback.) 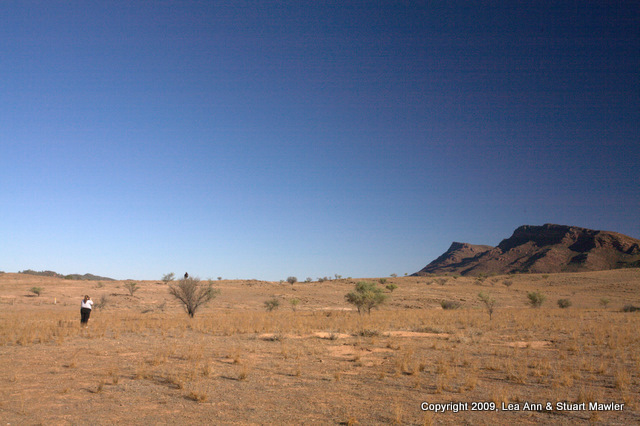 Except for an adventurous and creative few, they all essentially felt that the Outback is boring. Nothing to see here. Move along, please. If you look back at the map, you will notice that we had not gone very far and could not seem to drive more than 10-20 kilometers without stopping to look at something. Clearly, we were bored. Darn this trip to the Outback. Did we happen to mention that we ended up taking about 7000 frames on this trip? Very bored indeed. Nothing to see here. Move along, please. 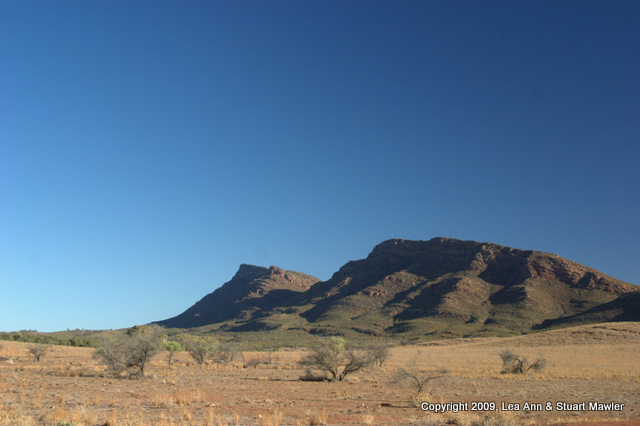 Stuart had read some random blog about driving through this part of South Australia and had heard something about a place called Wilpena Pound, which is a large, bowl-shaped mountain formation. The area sports some interesting views, unusual flora and fauna -- basically, it sounded like something we could not pass up. 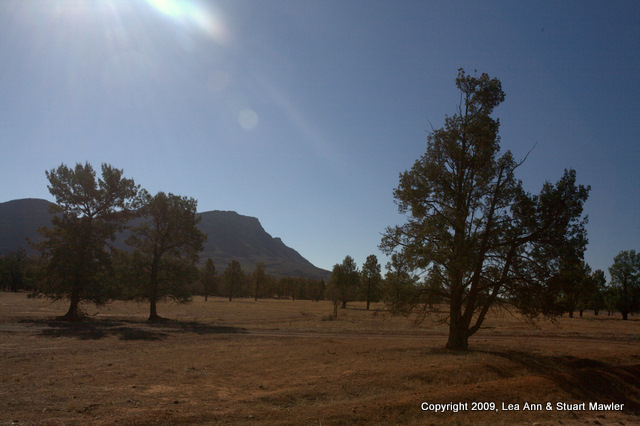 There were parts of the area that looked remarkably like Northern Arizona, around Flagstaff. We like that area, so it was almost like visiting someplace we had been before. The picture to the right captures some of that idea. You can also see the eastern edge of The Pound in the left center of the frame. 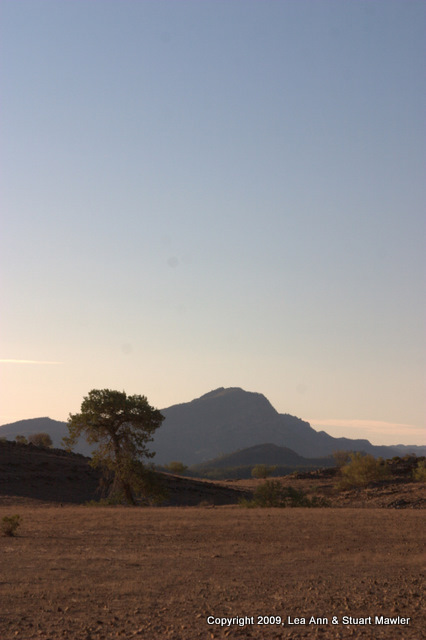 We had this notion that we might take the not-too-long hike into the center of The Pound or perhaps up to one of the lookouts along the rim. Of course, that would require being able to finish before dark, which would, in turn, require starting our day before noon. In our defense, our academic obligations were the cause of our late start. We generally have a good excuse for not getting started early. Always be prepared with a good excuse. Please be creative. Show your work. 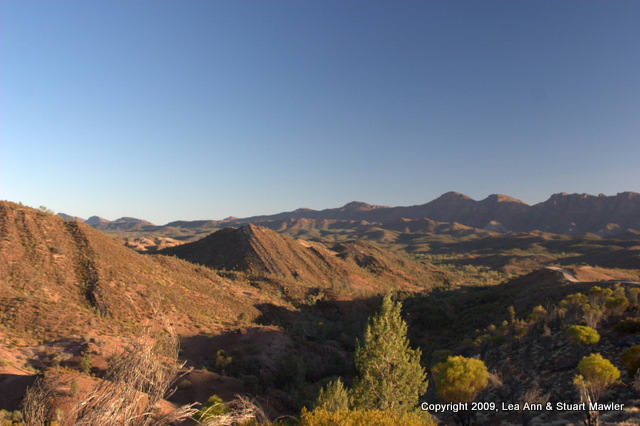 Hence, instead of taking a long hike, we decided to simply admire Wilpena Pound from outside, allowing us to take more "interesting" routes to Parachilna. One of the things that Lea Ann likes best is a pretty bird. It would be even better if it were a large attractive bird of prey. In fact, it would be completely awesome if she were to run across a large, pretty bird of prey, who would sit still and let her take its picture. In the wild. Captive birds are no challenge. 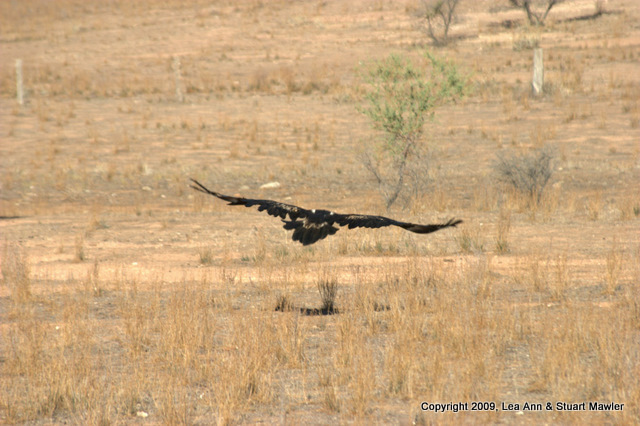 A wild bird of prey is not only flighty, but potentially a bit dangerous. 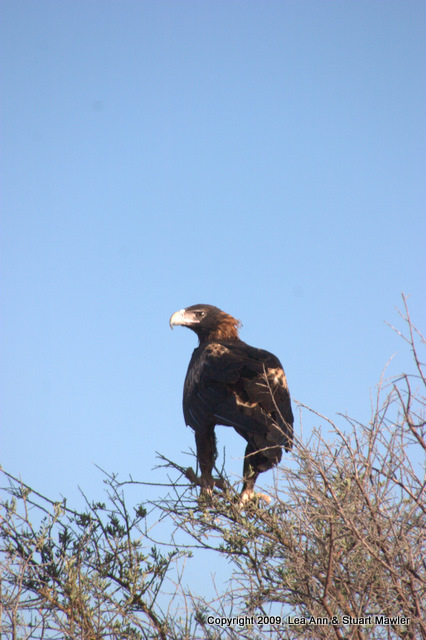 On our way out of Wilpena Pound, The Flinders Range delivered Lea Ann a personally-wrapped package with a big gold bow: a wedge-tailed eagle on a tree. 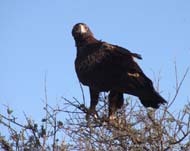 Of course, we had no idea what it was, though we were fairly certain it was an eagle. 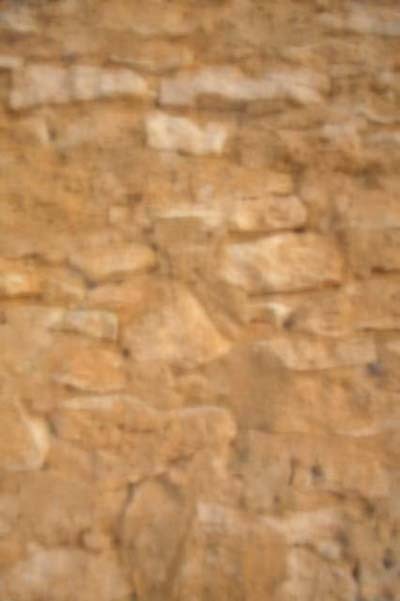 She spent quite some time taking pictures, getting closer and closer, trying to capture just the right image of the majestic bird. 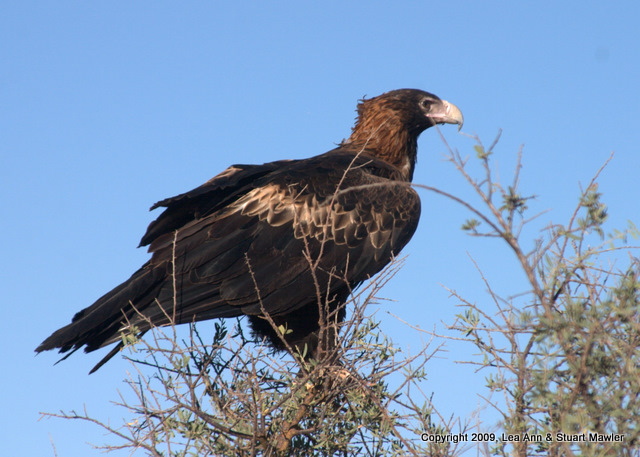 Naturally, as with all eagles, the wedge-tailed eagle turns out to be a bit of a scavenger. More on that later. Let's just bask in the image of the majestic bird, shall we? 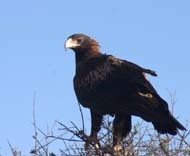 Besides, we had been subjected to the hustle-and-bustle of Port Augusta for so long that it was nice to be out with genuine Wild AnimalsTM. We have a pretty long lens, but those pictures were taken from a pretty darn close vantage point, as you can see from the pair of pictures below. The one on the right actually has circles to highlight both Lea Ann and the eagle. We are both fairly certain that, for a while anyway, the eagle was thinking, "Hey, maybe I can take this one home for dinner..."
Fortunately for Stuart, the bird did what birds do and took off for a safer place, free of clicking shutters. It is a very long way from this spot to anything one might call a "hospital", not that there was any real danger. The by-product of a successful interaction with a huge bird of prey is the freedom to move along with a sense of satisfaction. Unless you happen to run across a whole bunch of other cute critters. Like an entire field full of honest-to-goodness free-range kangaroos. 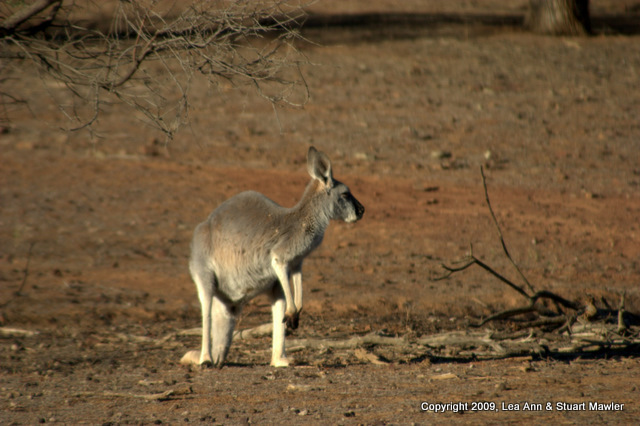 Yes, we know, kangaroos are to Australians what white tail deer are to residents of the Mid-Atlantic U.S. That is to say, they are a nuisance and a hazard. And still... We don't have kangaroos in the Mid-Atlantic U.S. 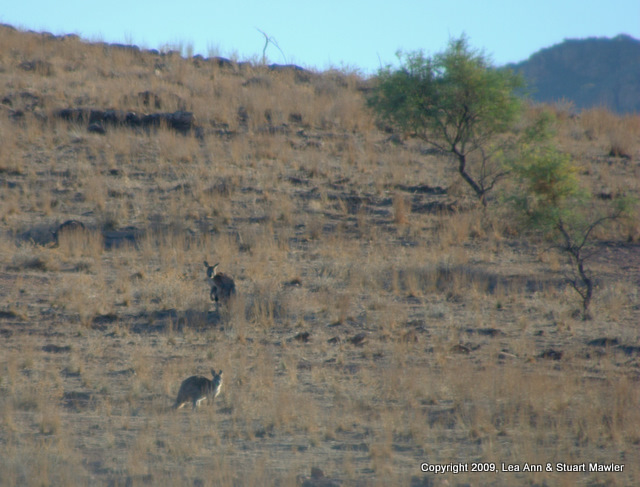 Despite the fact that many of the 'roos were not as close as they might be, we stayed to take quite a few pictures. 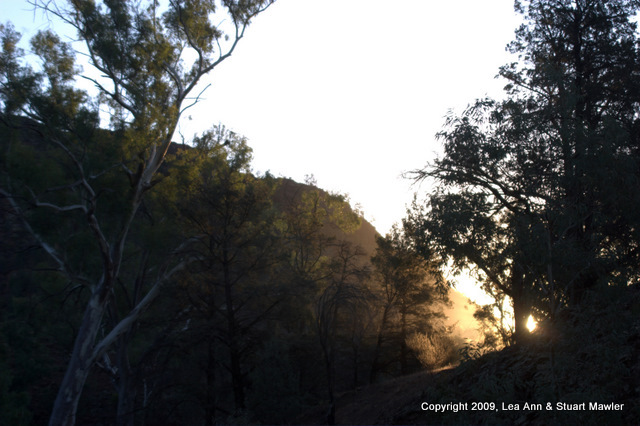 The evening light and the hills in the background also provided impetus to stay and get great shots. 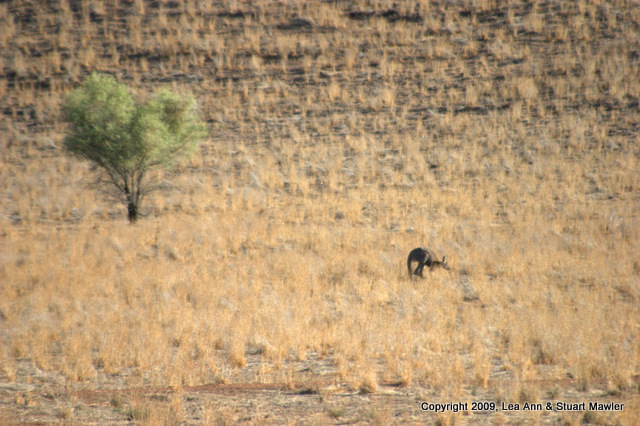 Besides, the more we looked around, the more it appeared that there were kangaroos everywhere. 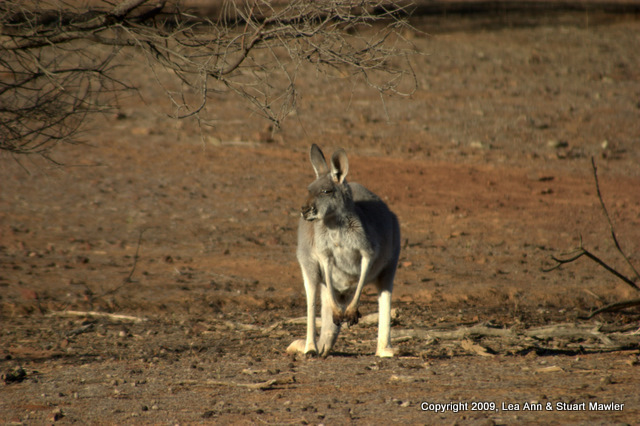 It is quite possible that there is more than one type of large hopping marsupial out there (e.g., grey and red kangaroos and wallabies). 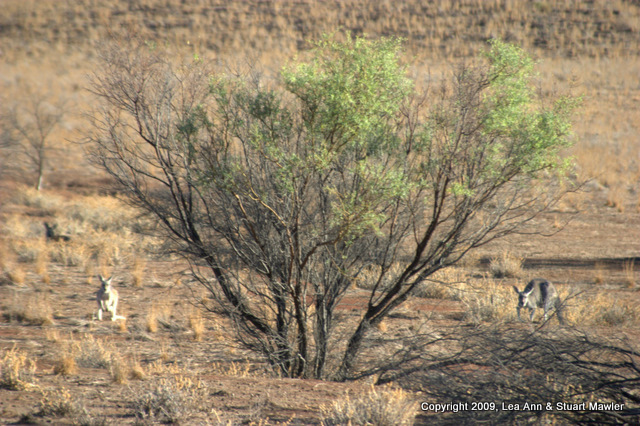 After a while, we assured ourselves that we would, in fact, see more kangaroos on our trip, allowing us to move along. A few feet later, we stopped to talk to this critter, who seemed not at all concerned about us. The Bunnyroo Valley Scenic Route is one of the most "interesting" roads we took in all of Australia. 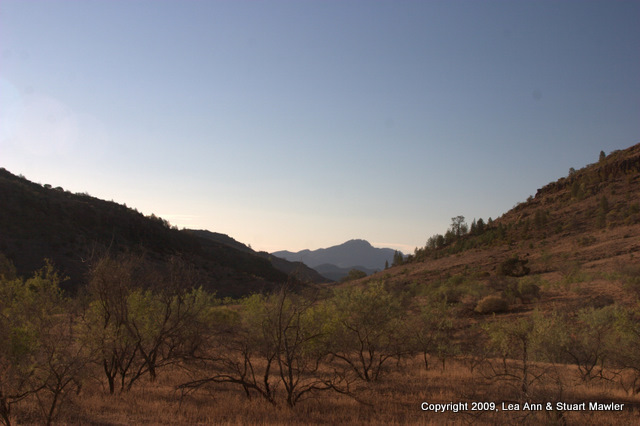 It varies between your average dirt road, your basic ridge-top dirt switch-back, and dry creek bed. It can be a bit rough, but there is truth in advertising here -- it delivers scenery, as promised. Just a few hours before, we were shocked and pleased to see a whole field of hopping marsupials and now they seemed to be lining the road. 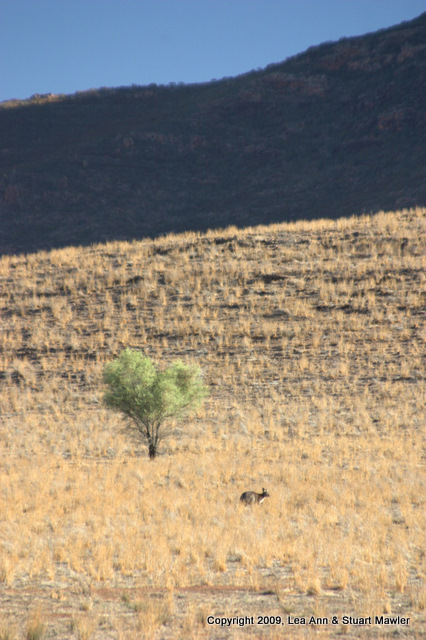 As mentioned, some of the wallabies do not seem to realize that this valley is not for them. There were a couple of nice views, including this one. The hill just to the left of center in the left picture is called "Razorback". The evening light really brings out why they call it that. 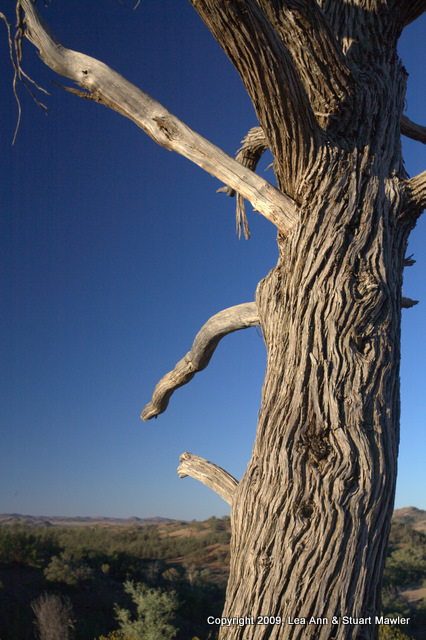 To have the views above, we took a short walk to the top of a hill, which was crowned by an excellently gnarled tree. There is a bit of joke between us that, if the picture is directly into the sun, Lea Ann took it. If the picture includes dead things, Stuart took it. This is mostly true and, in both cases, sometimes creates really interesing pictures. 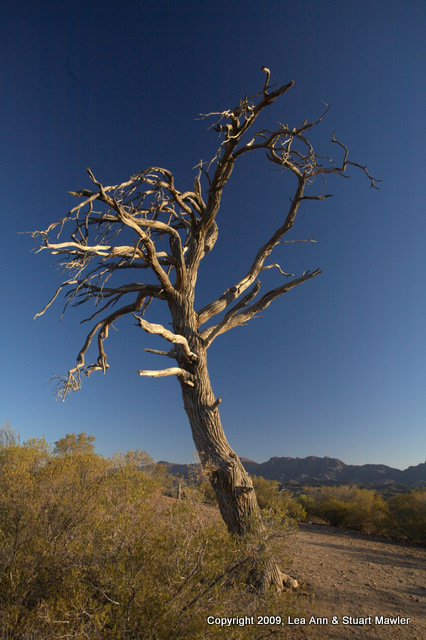 Stuart finally managed to get just the right view of the gnarled dead tree here. Ironically, it is both a dead thing and directly into the sun. We are definitely better together. 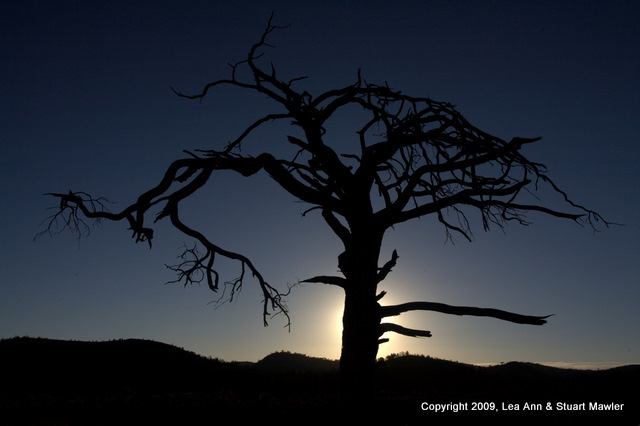 One of the best things about being out in the middle of nowhere is that you see very few people. They don't get in your pictures. And they don't scare off the wildlife. 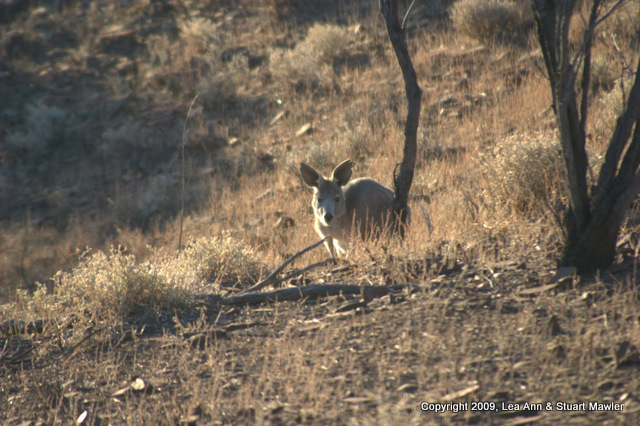 On the way back to the car, we detected a wallaby with slightly chewed ears. We just acted nonchalant about it and it sat there safe in the knowledge that we could not see it. (Ok, so they are cute, but not that smart.) It was nice to see the evening light outline the critter like a halo. It was, however, really starting to get late (as the light in these pictures makes pretty clear), so we could not spend too much time with the "hidden" wallaby. We needed to get to Parachilna, just in case they lock the doors at 9:30pm and/or run out of rooms. And, in answer to your obvious question, you get the obvious answer: no, we had no reservations anywhere. Nevermind that the official population of Parachilna is 5 (yes, "five"), and that the next place to stay is tens of kilometers away. If you have never watched it, consider the WWII movie Kelly's Heroes, from which comes the quote: "Stop it with the negative waves...". Since we were running late, we stopped to take some additional random pictures. Unfortunately, we found some cool rock formations that would have been great in bright light. Barring that, we had to take the best picture we could, then "fix it in post". Sometimes that is successful, sometimes it isn't, but we had to try. 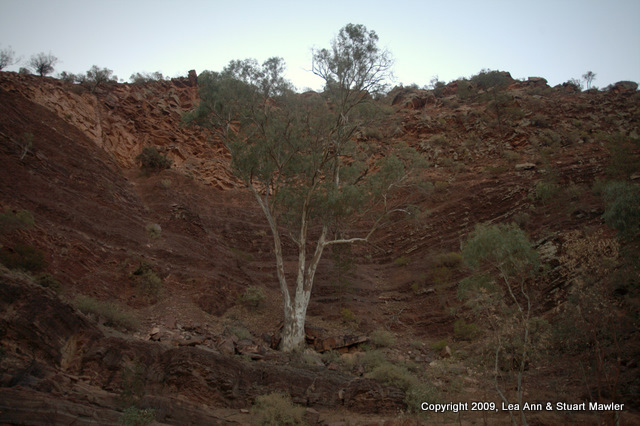 The best part of this effort is the gum tree clinging to the side of the cliff. 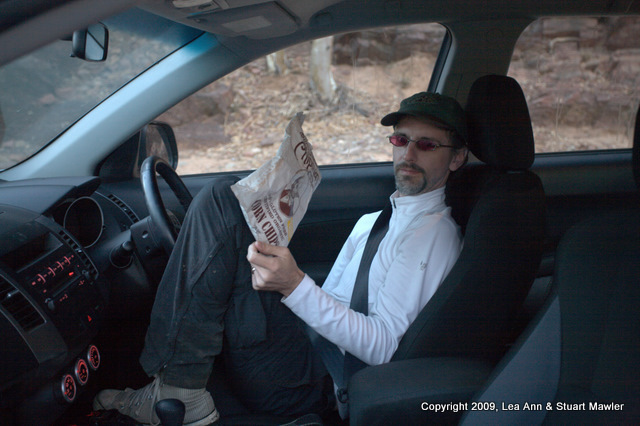 In point of fact, Lea Ann was out of the truck, trying to get pictures of the rock formations, while Stuart sat on his rear in the driver's seat. Apparently, he sees himself as "all that and a bag of chips". Well, he certainly finished the bag of chips, anyway. And, yes, those are organic, gluten-free corn chips. We had an entire box full of gluten-free and mostly organic food. Much of it purchased in the Outback. Finally, we hit the road toward our destination. Until we were stopped by the stunning sunset through the mouth of the valley. This last picture before sunset was literally taken right at the point that the road emerges from the valley. Ok, with the sun actually down, we could get on with it. Which is to say that the pictures we took at the next couple stops were not quite up to par for inclusion on this page. Eventually, all light left the sky. At that point, we were still out on the dirt roads. 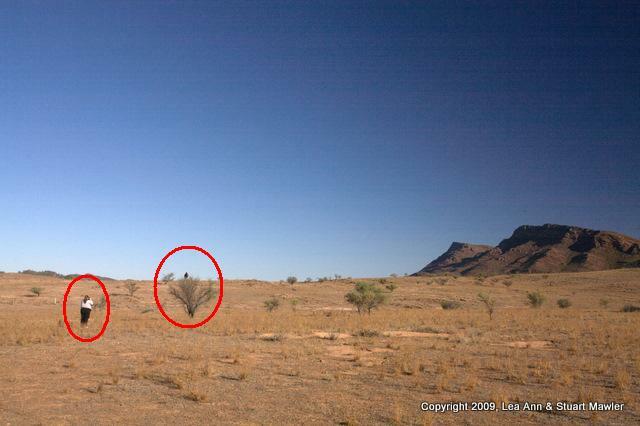 In the Australian Outback, one of the big problems with a dirt road in the desert at night is being able to tell where the edges of the road are. What makes this dirt a "road", while that dirt is not? With sufficient caution, we were able to get out to the main road leading to Parachilna. At this point, we should note that the overview map has a highly simplified route. 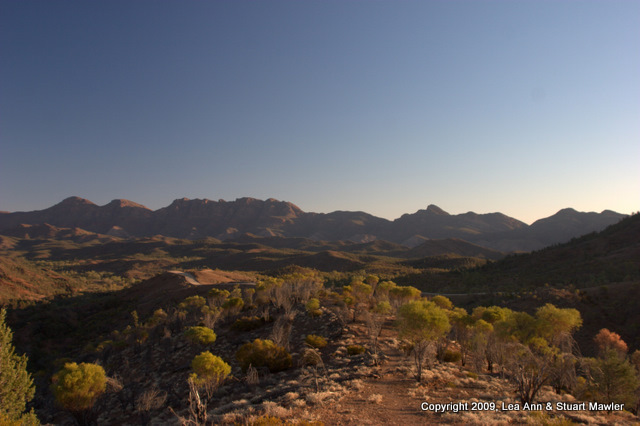 If you look at the Google Maps version, you will get a more accurate picture of our route from Wilpena to the main road. It was not direct. Out on the main (and importantly paved) road we picked up speed in our quest to have a place to stay. And right ahead of us, our headlights lit up the belly of a Kangaroo. Standing in the on-coming lane, facing the far shoulder. Yes, we said our headlights illuminated his belly. 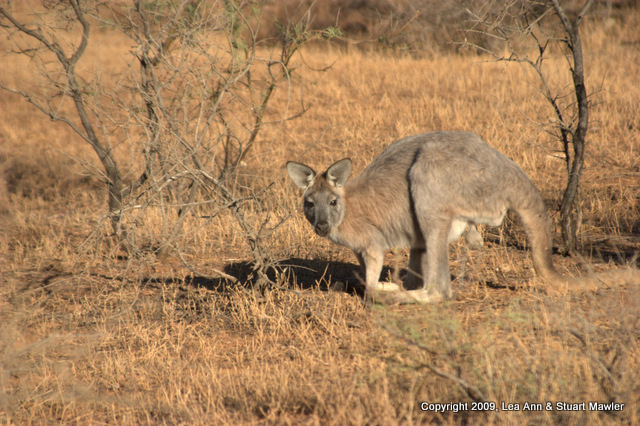 We were driving a relatively tall SUV and our headlights only illuminated the belly of the Kangaroo. Holy Kangaroos, Batman! "Oh, so you didn't kill him, then." Stuart hit the brakes and took evasive maneuvers, but, like a squirrel, he turned and hopped right into the side of the truck, making quite a thud. Much animal-friendly, vegetarian, liberal-guilt-inspired hand-wringing ensued. We backed up to see what kind of damage we might have done, but he was nowhere to be seen. 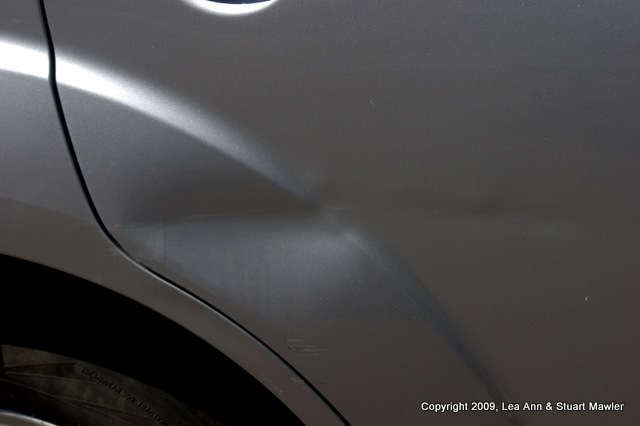 Once in Parachilna, we took a look at the driver's side, finding a head-shaped dent and claw marks down the doors. That Roo is going to have a headache, but probably little more. Phew. Once we reached Parachilna, we found that they had a room. They also had a great beer and wine selection. Their menu was quite good, but they were out of many things. Probably has something to do with running a restaurant in the middle of a town with a population of 5. No matter; what they did have was good. At some point, we noticed people gathering near the railroad tracks, asking about schedules. They were not intending to get on a train. 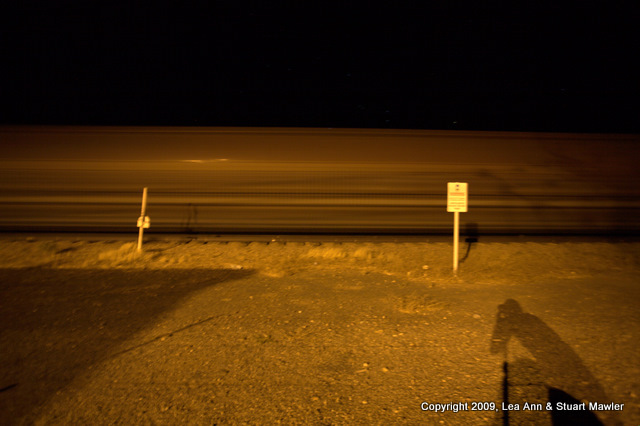 Instead, they were waiting for the longest coal train in all of Australia to pass by on its way from Leigh Creek to Port Augusta. 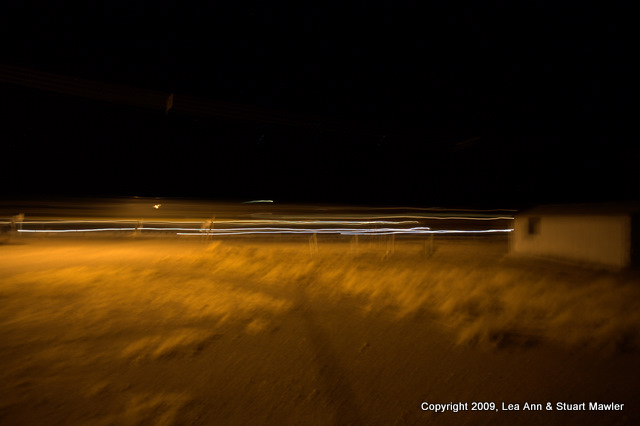 Our parting shots before bed are these two random shots of the passing train. The one on the left is the locomotive (you can tell by the lights). The one on the right is just a series of coal cars. Stuart took the one on the right with his camera balanced on a fence post, so you can see his shadow in the lower right corner of the frame. It would later turn out that Parachilna was one of the two best places we stayed on the entire trip. 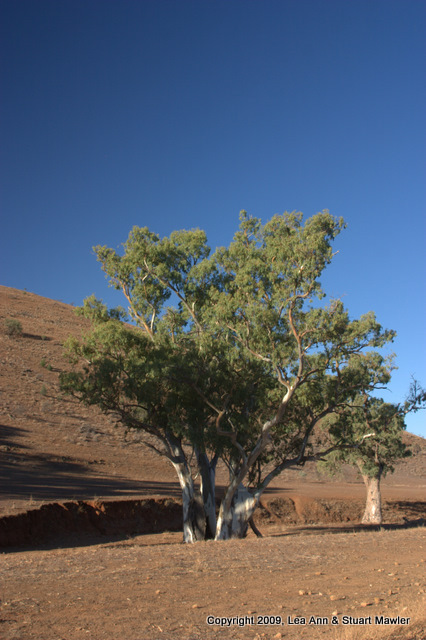 If you happen to be driving through the South Australian Outback, be sure to stop in for some good food and drinks.